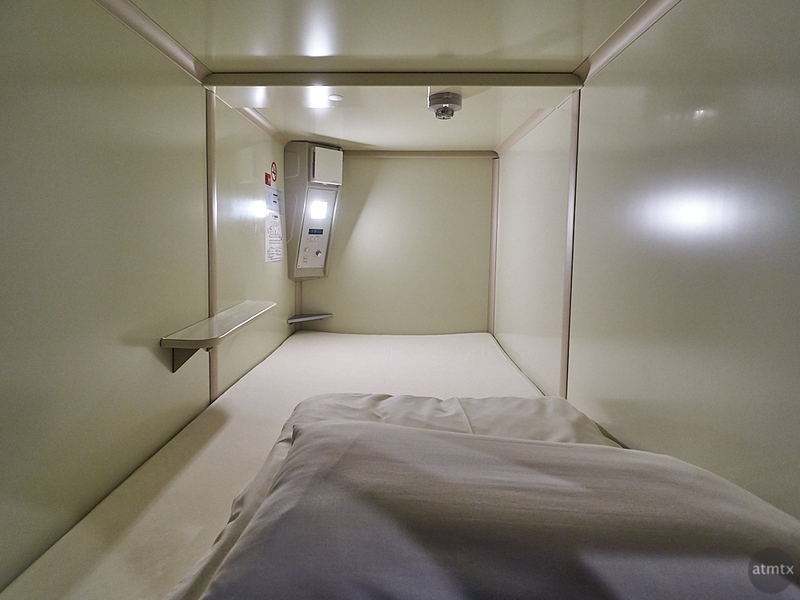 I always wanted to try a capsule hotel which, until recently, was a distinctly Japanese construct. They are designed for people, usually men, who wanted or needed to stay overnight, inexpensively, in the big cities. They are basically cubbies that are large enough to hold a bed. For my overnight stay in Hiroshima, I found a place online that has great ratings. It’s called Capusule Hotel Cube Hiroshima. Not only did I experience something new, it was only 3,000 yen to stay the night, which is currently about $28. It was centrally located and conveniently near a streetcar station. I’m glad I gave it a try, though it wouldn’t work when traveling with my wife or family. It’s best when traveling solo, though I suppose you can have friends staying in nearby, separate capsules. There’s only room for one person. There’s a curtain for privacy. Men and women stay on separate floors and don’t share any of the facilities, other than the front desk. In the men’s section, there was a common room with a television and desks. There was a communal muti-sink area and bathrooms. I was happy to discover that the shared showers are private, with separate changing and showering rooms. There’s also a locker room where you can store your valuables. The lockers were barely large enough to fit a regulation airplane carry-on roller board. There are other areas with open shelving to store larger suitcases. The capsules are stacked two high. It’s basically a quiet area were you can read, sleep or play with your electronic gadgets. 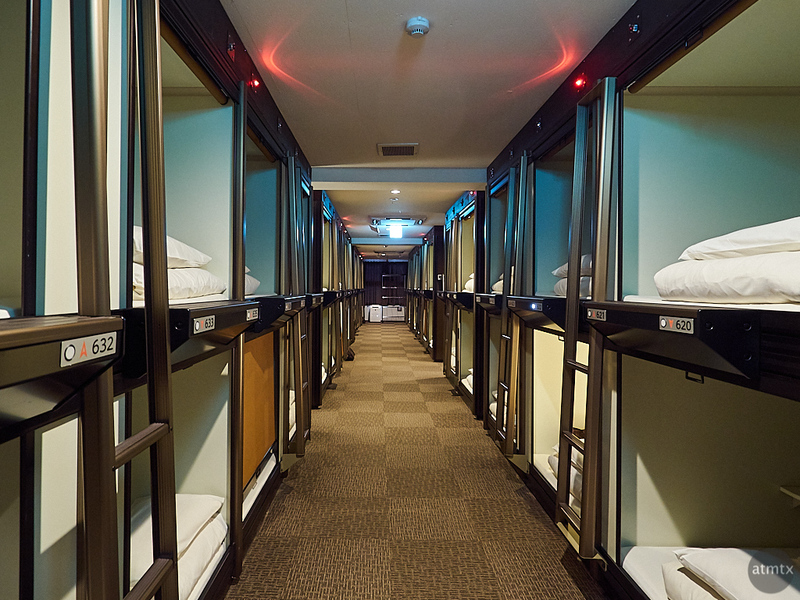 I heard some other capsule hotels have built-in TVs but they take up precious space. An employee at the Cube said that their capsules are a little larger than the older ones, and the lack of a TV makes them feel bigger. I’m not very fond of small spaces, with perhaps, a very mild version of claustrophobia. But I found that the capsules were large enough for me, that I didn’t feel uncomfortable. I can sit up, but not stand, inside. My only challenge? Charging my electronics, including all the cameras I brought. There was only one electric outlet in the capsule. If I ever stay at one again, I would carry around a small, multi-outlet power strip. I ended up charging my multiple cameras at the desk area in the common room. I was so tired through, from the long day of photography, that I dozed off multiple times. 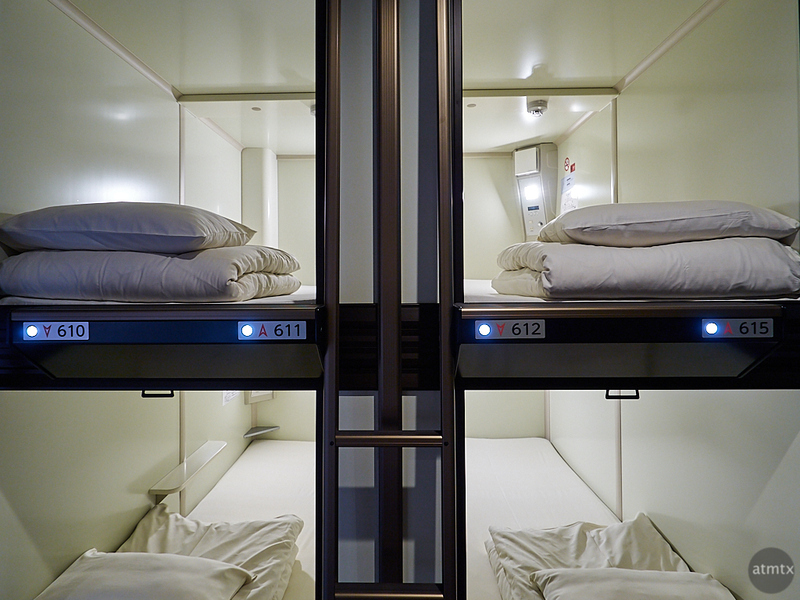 I don’t know if I would stay at a capsule hotel in other countries. Japan is generally so clean and safe that the entire experience seemed novel and interesting. There was no sense of discomfort or suspicion. Traveling with a lot of electronics and camera gear did add extra effort however, especially if I wanted to secure my gear in a locker, which was in a different area from the capsules. The place was super clean and only a couple of years old. While it cost 3,000 yen in Hiroshima, a staff person said the equivalent Cube facility in Tokyo costs about 5,000. I understand that’s more expensive than some of the older, smaller places. Maybe someday in the future, I’ll try one again. Perhaps in Tokyo. You can try the deluxe ones too they are much bigger with a small desk so you can charge all your equipment. The one I go to in Kyoto has one shower and bathroom for only 4 capsules. Thank you for your suggestion, Mchan. Sounds like the 4 capsules, one shower setup will be perfect when traveling with friends. I’ve often wondered about these places. Thanks for sharing your experience. BTW, a question relating to your experience of Japan: Do you speak Japanese? I’ve heard some people say that unless you have a good command of the language, travelling around Japan can be difficult and frustrating. I’d like to hear your thoughts on that. Thanks. Hi Cedric, I’m far from being a native speaker. Perhaps at a conversational level for everyday stuff. I can’t read and write Japanese, so the signs are a challenge, though most of the train stations have romanized signs. I think the good news is that the Japanese are generally courteous. And, while it maybe frustrating for some, at least it’s not dangerous. Also having smartphones to look things up and with GPS and maps makes things a lot easier. At least compared to the pre-smartphone era. Thanks for the insight into this. I’ve always wondered what it would be like. Only one plug…yikes. Yeah, I really needed a power strip. We stayed at a very new hotel in Boston and the room was for two people, but was essentially the same concept, just big enough for a double bed. But it was in a great location, clean, very pretty and the bed was comfortable. I was really pleased to find a clean and comfortable place for the night. Normally ANYTHING in downtown Boston is way beyond our means. Did your room in Boston have a private bathroom? Or did you have to share it with others in a hallway? Thank you, Mike. The one plug thing is tough for technologists….